A lab accident changes the routine life of biochemistry professor Jack Sutree. He’s left with the ability to see fragrances flowing off organic substances. When he looks at a person he sees an alternate vision of their true self. Jack and his predoctoral candidate, Ram, struggle to understand these visions. Jack encounters a homeless musician, named Bazemint, and is taken by a haunting vision and music associated with her. He determines Bazemint is his best chance at understanding the phenomenon. Dr. Redfield, a university Regent with strong ties to the pharmaceutical industry, gets wind of Jack’s discovery and wants it for developing new psychoactive drugs. He confronts Jack, Bazemint and Ram resulting in a surprise discovery and Jack redirecting his life. 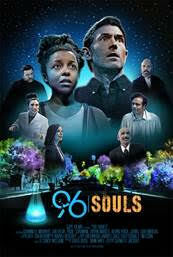 96 SOULS was written and directed by Stanley Jacobs. The film will open theatrically in select theaters on May 26. Gravitas Ventures will release the film on VOD and across all other digital platforms on May 30, 2017.